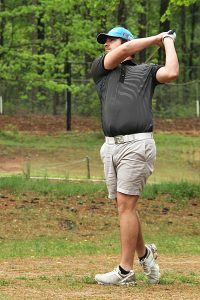 Three region golf titles, 5 low medalist honors and several state and sectional qualifiers were part of DeKalb County‘s haul in recent region golf tournament action. The Region 2-6A boys’ and girls’ team titles and medalist honors came home to DeKalb County via Lakeside and Tucker. The Lakeside Vikings behind a low medalist performance of 74 from Drew Smith shot a team total of 307 to win the region title and also qualify for the Class 6A State Tournament on Monday, May 16th at Spring Hill Country Club in Tifton. Tony Bryant (76), Zach Garlow (78), Harris Dasher (79) and Imran Dewjee (79) gave the Vikings the top 5 scores of the tournament. Brennan Cox finished in ninth overall with a 92. Alcovy was a distant second to the Vikings with a 368 team score. The Tucker Lady Tigers led by medalist Daja Nicholson with a 102 combined for a team score of 330 to outdo Rockdale County’s 351. Megan Hayes tied for third in the individual standings with a 105 and Lilly Sarubbi shot a 123 to finish eighth. Dorjea McClammey finished 14th with a 145. The Dunwoody Wildcats teamed up for a 306 in winning the Region 6-5A championship at Stone Mountain. Jackson Perry was the medalist with a 70 and the Wildcats took third through seventh to round out the scoring. The team lined up in order with Elijah Dwoskin (77), Tim Tembath (79), Nick Tembath (80), Davis Brainard (81) and Will Bentson (82). Dunwoody will play in the state tournament on Monday, May 16 at Bartram Trail Golf Club in Evans. Martin Luther King’s Kameron Wyatt qualified for the state sectional at Georgia National in McDonough on Monday, May 2 finishing second overall with a 76. Dunwoody’s Lauren Callahan shot an 88 to win medalist honors and qualify for the state sectional at Herron Bay in Locust Grove on Monday, May 2. Arabia Mountain shot a 380 and Chamblee a 389 to finish third and fourth, respectively, the Region 6-4A tournament behind Marist. Arabia Mountain’s Nylan Washington finished 12th overall, but shot a sectional qualifying score of 85 and will go to Achasta Golf Club in Dahlonega on Monday, May 2. 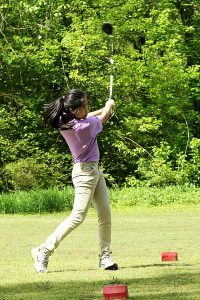 Chamblee’s Tiffany Li finished fourth in the girls’ individual standings with a state sectional qualifying score of 99. She will go to Chestatee Golf Club in Dawsonville to attempt to qualify for the state tournament. Cedar Grove’s Mariah Kuranga shot a 79 to win low medalist honors in the Region 4-3A girls’ tournament. She earned a trip to the state tournament on Monday, May 16. Cedar Grove’s Noah Kuranga finished second in the boys’ individual standings with a 72 to qualify for the sectional tournament on Monday, May 2 at Fields Ferry Golf Club in Calhoun.